The new Trinity Business School building is to be officially opened on May 23 following a five year long project to develop the site. Construction on the building is expected to finish in March, according to Provost Patrick Prendergast in an address late last year. College was granted permission to build the new Trinity Business School in 2015. The new building is over 11,300 metres squared and is comprised of eight storeys, with six above ground and two below. 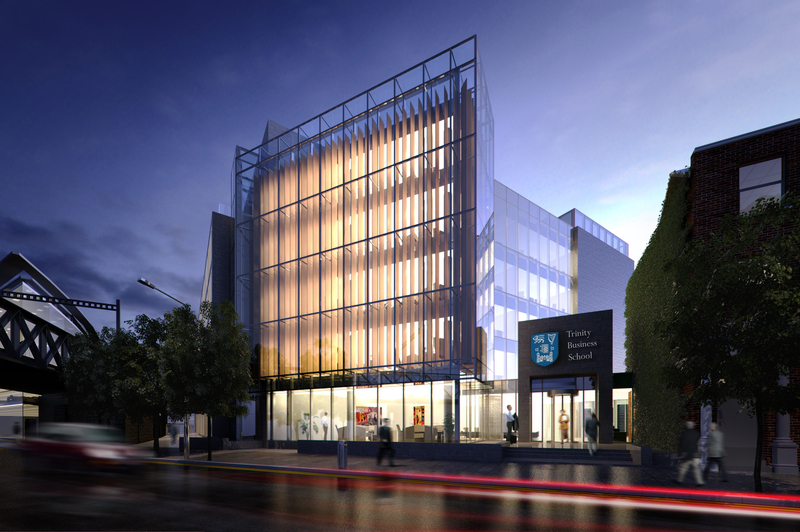 The building, located on Pearse Street, includes a 600-seat auditorium and 140-seat lecture hall, alongside several smaller lecture theatres. It is a near-zero energy building, containing natural ventilation, solar panels, and two green walls on the outside in keeping with College’s sustainability policy. Trinity News previously reported that Sodexo Ireland, the current catering company of the Perch Café in the Arts Block, had won the contract for the restaurant in the new Business School. The former contract relating to the Perch is worth a reported €1 million, although the value of that for the new restaurant was not revealed to Trinity News by Professor Andrew Burke, Dean of Trinity Business School. Following the circulation of a survey by the Chief Operating Officer, Geraldine Ruane, “Forum” was decided on as the name of the new restaurant, having received the highest number of votes from students. Ruane stated that the name “suggest more than just a space or restaurant facility but an area in which ideas are discussed, networking takes place, and people are intellectually stimulated”. Speaking to Trinity News earlier this year, Professor Burke commented that they were “conscious that we will have a lot of professionals and executives in the building as well”. The restaurant is to encompass a number of different areas, each of “different styles”, according to Burke. The space includes an executive lounge, an outdoor area, and a more open plan space where students can sit together and engage in group work. Despite the use of the word “executive”, Burke emphasised that all of the areas are very much open. In addition to the restaurant, there is also to be a café situated in the basement of the new building. Speaking at an event in September, Provost Patrick Prendergast stated that Trinity had invested €80m in the project, with €20m coming from philanthropic donations and €60m from investment and loans. The 2019 QS Global MBA rankings recently placed Trinity’s Masters in Business Administration as the second best in Ireland, 33rd in Europe and 96th in the world. Michael Gilna is the current Investigations Editor of Trinity News. He is a Senior Fresh Law student, and a former Senior Reporter.